L’ARIEGEOISE is a mass cycling event on public roads, organized under the umbrella of the Fédération Française de Cyclisme. It takes place on Saturday 29 June 2019 and offers 5 circuits between Tarascon-sur-Ariège and Auzat. Only the cyclo-sport circuits are timed: L’Ariégeoise XXL, l’Ariégeoise, la Mountagnole XXL, la Mountagnole and Elles font l’Ariégeoise.com. the Gran Fondo circuits of la Passéjade/Passéjad’Elec are not timed and have no classification of finishers. By subscribing, all participants accept these regulations and accept the totality of all their clauses and accept the usual risks associated with cycling, such as individual or collective falls or crashes. Ariégeoise XXL and Ariégeoise are open to all, licence-holders or not, over 18 between January and December 2019. Mountagnole XXL, Mountagnole, Elles font l’Ariégeoise.com are open to all, licence-holders or not, over 17 years old. Licence-holders from the Fédération Française de Cyclisme or another federation involved in competitive cycling (UFOLEP, FSGT, FFTRI exclusivily) must complete the subscription form and download a valid copy of their licence (2018/2019 season). Other participants (FFCT or other federation licence-holders), foreign cyclists (holding a regional, national and/or UCI licence) and non-licence-holders must complete the subscription form and supply a standard medical certificate showing no impediment to competitive cycling and dated less than a year from the date of the event (model form downloadable from www.cyclosport-ariegeoise.com). FFH licence-holders should provide their FFH licence as well as the licence provided by the FFC allowing competitive cycling, conforming to the regulation medical criteria. Cyclists who are minors, whether or not licence-holders, must apply the same rules and must also provide a parental authorization. 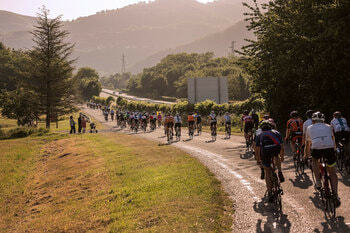 Gran Fondo (Passéjade) : open to all, licence-holders or not, from over 1é years old. Children under 16 must be accompanied by an adult riding the same circuit. This person is considered responsible for the child over the whole circuit. An adult parent can be responsible for all their children. A third-party adult can only be responsible for one child. In both cases, it is obligatory to provide a parental authorization signed by both parents as well as a recto-verso copy of both identity cards. If the responsible adult has left the circuit, the child or children being accompanied must also abandon the circuit. All minors must provide a parental authorization. The subscription of an under-16 minor must be made by intermediary of an adult who validates the subscription form. It is the responsibility of each participant to ensure their subscription form is complete before collecting their numbers. Any missing element means not being allowed to start the circuit. From the 4001st rider or from 16 May 2019 to 16 June 2019. Cyclo-sport riders having received a commendation in terms of placing in another event and with the obligation of presenting proof (certificate, classification) will have priority on the start line, as far as places are available. The Ist, 2nd, 3rd categories are also priority on the start line, but these categories are only taken into account for the scratch classification (FFC rules). New: in addition to the classic criteria, an Otakam index under 25 (men) and under 50 (women) also (if requested) gives access to a priority number. All the priority numbers on the start line will be credited with the same time. The classification of the first 3 for each race is established in terms of passing the finish line and not in terms of time. Incomplete subscriptions can be updated until 24/06/2019 by connecting to personal accounts with identification and password. After this date, missing documents must be presented on the day that numbers are collected. Change of circuit may be made with no extra charge and by telephone or email up to 20/05/2019. From this date any circuit change can only be made on Friday 28/06/2019 when numbers are collected, with a supplementary charge of 10€. No change is possible on Saturday 29/06/2019. Only reimbursement requests directly linked to the following serious causes will be accepted: accident, total incapacity, illness. The reimbursement will be made in the two months following the event and only after a written request to the l’Ariégeoise Cyclo Club and received before the 01/07/2019, with a medical certificate or official justification included. In this case, reimbursement will be 80% of the subscription cost. After this date, and apart from these reasons, there will be no reimbursement. If you have not been able to take part in the event and your subscription cannot be reimbursed, the jersey can be sent, after a written request, up to 5 months after the event. Final closure after the figure of 5500 participants is reached or by 16 June 2019 23h 59m at the latest. Roads in the Ariège are open to traffic during the event. Participating in a mass cycling event on the public highway implies: conforming to the highway code and any Prefectoral and/or Municipal ordinances, only using the right-hand side of the road and ensuring personal safety by adapting speed to circumstance. Support vehicles are forbidden; they are dangerous, disrespectful of other riders and thus undesirable. Any participants using a personal supporting vehicle that is noted by a commissaire will be disqualified. You are advised to arrive at the start having undertaken a serious training programme. L’Ariégeoise is a mountain event with some difficult passages to overcome. Civil Liability: The organization has an insurance contract through the FFC insurer, Gras Savoye, covering its civil liability as well as that of the participants for material and physical damages that might be caused to a third party or between themselves. It only functions for the official itinerary and for the duration of the event, for participants correctly subscribed and recorded at each control point (the timing acting as validation). Physical injury, individual accident insurance: In accordance with Article L321-4 of the Code du Sport, the organization underlines the interest of having a personal accident insurance covering the type of injuries that this sort of event might cause. It is up to participants to organize such insurance. Licence-holders need to check with their federation that they are adequately covered for any physical injuries possible in such an event. If not, it is in their interest, as well as for non licence-holders, to subscribe at least to the insurance or other guarantees from their chosen insurer. Material damage and responsibility: Neither the organiser nor its insurer covers damages that could occur to material or equipment of the participants, particularly in the case of a fall or theft. Each participant should obtain guarantees for such risks from their own insurer. Participants accept the non-responsibility of the organisers for the surveillance of goods or personal objects in case of theft or loss. Objects, accessories or bicycles left with third parties (members or not of the organization) are entirely under the responsibility of the participant depositing them. Technical aid with emergency assistance and radio liaison is provided thanks to the organisation’s cars covering the event. You should organize your own mechanical aid (punctures …), however, you will find across the circuit, mechanics and basic spares payable on the spot. If you cannot pay immediately, a bill will be sent you after the event by the mechanic who aided you. Appropriate medical aid: 8 emergency doctors, ambulances, fixed red Cross posts, liaisons with SAMU09 and Fire Brigade. Before the start: obligatory passage by the “parc coureur” corresponding to your chosen circuit to check the electronic chips. To ensure the smooth running of the event, there are different controls using the electronic chips: the start, on the circuit and at the finish. Any participant not recorded at one of these controls will not be classified. All participants outside the time limit and passed by the broom wagon, must surrender their number. If they wish to continue, it is at their own risk and outside the organisation’s safety net. The organisation’s signal teams are in place until the closure of the time limit. After this, the circuit has no safety net and feed zones are no longer assured. All competitors on an XXL circuit who are not recorded by 15h 30 at the village of Aulus-les-Bains are considered outside the time limit. Approved rigid helmet to be worn throughout all circuits. An e-bike; Exception: the Passéjad’Elec Gran Fondo is for e-bikes limited up to 25 kmph. The cyclo-sportive circuits are timed and result in classifications and awards. The age taken account of is determined by the year of birth, apart from those who are 18 in 2019 who must be over 18 at the time of the event. Professional and elite riders are classified scratch but not in the categories. Those present on the podium will be awarded. The first in each category. H: Disabled with FFC licence. The passéjade and Passéjad’Elec are Gran Fondos neither timed nor classified. The l’Ariégeoise is part of the Trophée Occitanie 2019. The reference circuit for men is the Ariégeoise XXL and for women the Ariégeoise XXL and subsidiary circuits are counted (see complete regulations on the Comité Régional FFC site). This trophy includes a performance indicator by OTAKAM. The points calculation is consultable on the regional committee site. The participants in the l’Ariégeoise XXL, l’Ariégeoise, La Mountagnole XXL and Mountagnole can receive certificates noted OR-ARGENT-BRONZE. Passéjade participants can receive a certificate of participation in the event. All participants on a l’Ariégeoise circuit expressly authorize the organizer directly, as well as its partners and media to use results, fixed or audio-visual images in which they may appear during the event, in all media, including promotional and publicity documents, over the whole world and for the maximum legal, treaty or regulatory duration. Any disagreement with this clause must be signaled by letter to the l’Ariégeoise Cyclo Club when subscribing. In conformity with existing legislation, the participant has the right of access, rectification or opposition concerning the digital information that concerns them. This information may be used, ceded, rented or exchanged, particularly for commercial purposes, results and the press. -La Patrouille Eco-Cycle: will be once again present. The role of the patrollers will be to encourage each and everyone of us to respect the environment. Remember to keep rubbish and packaging until designated areas. -Operation Zéro Déchets: Adhering to the Eco-Cycle Programme, the organization is engaged in a “Zero Rubbish” operation; A special zone marked by green netting will be available near feed zones. Any participant found leaving rubbish in the natural environment is at risk of being declassified from the event. If circumstances dictate, l’Ariégeoise reserves the right to modify at any time the circuit, feed zone position and control points, the distance of the circuit and to postpone the date and/or time of the event. If the event is cancelled due to force majeur or by decision of the Prefect for a motive outside the control of the organizer, the organization is relieved of all responsibility towards the participants. No reimbursements will be made. Specific regulations regarding the above are available on the site. Participation in the l’Ariégeoise implies an express acceptance by each participant of the regulations. All interpretation or claim concerning the event, the regulations or their application must be addressed in writing to the organizer. In any case of litigation concerning translations into other languages, the French version of the regulations takes precedence.